•The only desktop inkjet printer optimized for digital decorating and SubliJet-HD inks. •The first sublimation printer co-engineered with Ricoh. •Lowest start-up cost of any commercial product decorating technology. •Higher definition image reproduction with vibrant, true-to-life colors. •Faster throughput for greater productivity and profit potential. *Image cost and print speed estimates are based upon an 8.5” x 11” test image on Letter or A4 media and are provided for platform comparison purposes only. Results will vary depending on many variables including image size, media size, coverage, color management settings, etc. •Print up to 1200 x 1200 dpi for dazzling, HD photo-quality reproduction. > Better dot placement accuracy. 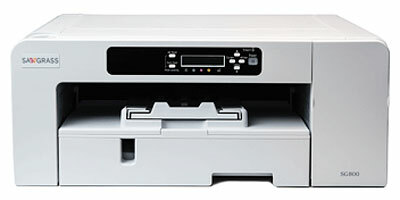 •Prints nearly 2 times faster than the Ricoh SG 3110DN – Up to 156 prints per hour. •Built-in self-cleaning routine keeps the printer running at its best, ensuring money-making uptime with minimal power and ink consumption. * Enjoy free color management options for Mac and Windows platforms when you use SubliJet-HD inks with the Virtuoso SG 400. * Virtual Device Driver makes it easy to reproduce vibrant photos and accurate spot colors that wow prospects and keep customers coming back for more. * MacProfile is specially developed to be used with our SubliJet-HD ink sets in conjunction with the Virtuoso Mac OS driver. Included are Sawgrass’ Palette Swatch Library and Proofing Palette, which is a collection of preset colors highly suitable for sublimation printing. Virtuoso SG 800 inkjet printers deliver crisp, gorgeous prints up to 13″ x 19″ / A3+ (with optional bypass tray) and maximum efficiency for product decorators looking for the highest level of reliability and throughput. •Faster throughput for greater productivity and profit potential.•Delivers prints up to 11″ x 17″ standard, 13″ x 19″ (A3+) with optional bypass tray. 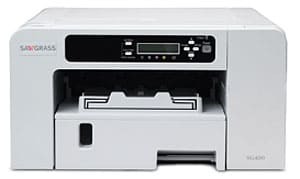 •Prints nearly 2 times faster than the Ricoh SG 7110DN – Up to 156 prints per hour. * Enjoy free color management options for Mac and Windows platforms when you use SubliJet-HD inks with the Virtuoso SG 800. Call for system package pricing!